Martin is a disability activist and pioneer of the Independent Living (IL) movement in Ireland. Martin has the lived experience of disability and has spent the last 50 years working to improve the lives of people with disabilities. Martin had the experience of institutionalised living in his early years, before moving into his own home. Martin was at the centre of influencing the move away from institutionalised living in Ireland. After time spent travelling in America, Martin returned to Ireland with the mission of spreading the word about Independent Living. He was involved in establishing the Centre of Independent Living (CIL) in Ireland, which opened in March 1992 and specifically targeted funding for Personal Assistant (PA) services. There are over twenty CILs in the country today. 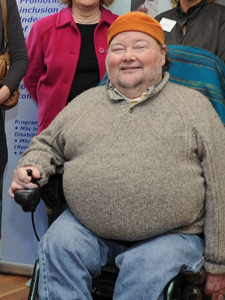 Martin was the Co-Director of the European Network on Independent Living (ENIL), which represents the disability movement on human rights and social inclusion, until January 2015. ENIL is based on solidarity, peer support, deinstitutionalisation, democracy, self-representation, a cross disability approach and self-determination. Martin’s main aim is to support people with disabilities to become empowered to lead independent lives. He believes PA services fulfill a vital role in enabling Independent Living, in that they are a facilitate individual choice. Martin emphasises how pivotal PA services are to his life, along with so many other people with disabilities. Martin co-founded Áiseanna Tacaíochta (ÁT) in 2010 to continue the work of empowering people with disabilities to lead independent lives. Martin also works as a Support Officer for the Disability Federation of Ireland (DFI). He is the Director of Disability Options, a company which provides individual training and support to people with disabilities on Independent Living issues. Martin currently sits on the board of ÁT and Headway, an organisation supporting people affected by brain injury, and gave over twenty years’ service to the State Board of the Citizens Information Board (CIB), leaving in March 2015.